Here’s the thing about so-called social media. It’s really stupid, people do things really fast without thinking, and what seems like a great idea usually turns into a total disaster. But for better or worse, many police managers and agencies think that posting stuff on Twitter, Instagram, and Facebook is a great way to get free—and positive—publicity. American policing has been under a microscope recently. Part of that has to do with some really disturbing and alarming posts from police officers that have either had too much to drink or just need someone to talk to besides the Internet. The good news, if you want to call it that, is that it turns out this isn’t a uniquely American problem. 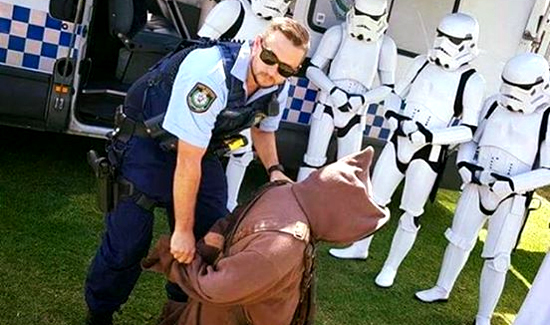 In Australia, police recently tried to be clever by posting photos of an officer fake-arresting a “Star Wars” character as Storm Troopers look on. This might be related to police militarization—the fact that the cops that made the post apparently just assumed that the Storm Troopers were the good guys because of their weapons and tactical gear. But one thing’s for damn sure. If you reveal to the world that you “don’t get” “Star Wars” while posting “Look at me! Isn’t this cool?” photos to the Web, odds are you’re going to have a bad day reading comments and responses. For better or worse (mostly much worse), we now live in the Marketing Generation. Police have to adapt to it the same as the rest of us.